Ralston Burdett Hemsley (June 24, 1907 – July 31, 1972) was an American professional baseball player. He played in Major League Baseball as a catcher for 19 seasons from 1928 to 1947. Born in Syracuse, Ohio, he was nicknamed "Rollicking Rollie". After playing another season in Cleveland, Hemsley was purchased by the Cincinnati Reds for a second stint on December 4, 1942 Cincinnati Reds season|1941]]. He was a disappointing stint with the Reds, playing 36 games and ending with a batting average of only .113, and was released by the Reds on July 17 as a result. However, two days later he was signed to a contract by the New York Yankees. His signing by the Yankees came when starter Bill Dickey went down with a shoulder injury. When Dickey's backup, Buddy Rosar, left the team without permission to take examinations to join the Buffalo police force and, to be with his wife who was about to have a baby, Yankees manager Joe McCarthy signed Hemsley to be the second string catcher, relegating Rosar to the third string position. Hemsley hit safely in his first six games as a Yankee, and raised his average back to nearly .200 by season's end. He served the 1943 season as a backup to Dickey as the Yankees won the 1943 World Series. 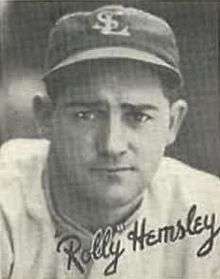 Hemsley played well in 1944 for the Yankees. Despite only playing in 81 games that season, he received a few MVP votes and made it to his 5th All-Star game. He left the team mid-season to join the U.S. Navy. He did not play during the 1945 season but he was signed by the Philadelphia Phillies on March 25, 1946 Philadelphia Phillies season|1946]]. After backing up Andy Seminick for a season, he was released, only to be re-signed again by the Phillies. He only played in two games during the 1947 season before being released and retiring. 1 2 3 4 5 6 7 8 9 10 11 12 13 14 15 16 17 18 "Rollie Hemsley Statistics – Baseball-Reference.com". Retrieved 2007-05-26. 1 2 3 "Rollie Hemsley – BaseballLibrary.com". Retrieved 2007-05-28. ↑ "Catching Feud May Speed Up Indian's Drive". The Sunday Morning Star. United Press. 16 April 1939. p. 26. Retrieved 9 November 2010. 1 2 "Buddy Gets Protection". Time. August 3, 1942. Retrieved 2007-05-30. ↑ "Hemsley Picked For Job Buddy Rosar Gives Up". The Milwaukee Journal. United Press. 20 July 1942. p. 6. Retrieved 9 November 2010. ↑ "Pennant Parade". Time. September 11, 1944. Retrieved 2007-05-30. ↑ "Timelines in AA's history, 1940". Retrieved 2007-05-28. ↑ Alcoholics Anonymous Comes of Age. Alcoholics Anonymous Publishing, Inc. 1957. pp. 24–25. 1 2 "Rollie Hemsley is dead at 65: Catcher played for seven clubs". August 1, 1972. Retrieved 2007-05-30 – via The New York Times.